We took so many wonderful family vacations growing up. Even when things were tight financially we always found a way to get away. All year we would put our spare change in an antique tin and then we would roll the coins before vacation to use for meals. My Dad has this great way of building excitement about our trips. Once he even came home from work and told us to pack our bags - we piled into the car and he surprised us all with a trip to Gatlinburg. But it wasn't always all my dad planning the trips. It was democratic. We had an RV at one point and each summer we took turns picking where we would go. I always picked the beach. Any beach. So as I looked through all these vacation photos, I realized there isn't any good way to pick just one. All of our trips were wonderful. If there were National Lampoonish disasters, I don't remember them (well, I remember a few things - but nothing huge). What I remember mostly was fun times bonding with my family. Awesome meals. Running out of the allowance I'd painstakenly saved for months only to have my Dad slip me a few extra bucks of spending money. Stopping at South of the Border even though it was the junkiest place on earth - only because my brother and I saw the 34th billboard on the interstate and just HAD to stop. So I picked the St. Augustine Florida photos. Because of the beach. And the smelly (whew!) 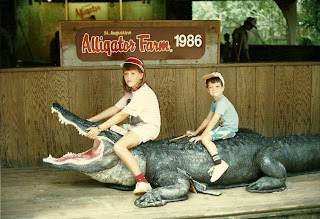 alligator farm. And their orange pumpkin jellyfish. 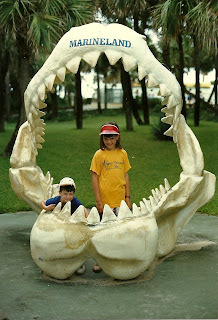 And because we always went to Marineland. What you can't see in this picture is Taylor's awesome Thundercats t-shirt. And the fact that he was wearing a squeaky duck billed hat. You can, however, see my awesome pink seal shirt and my red socks that match my red visor. We always ate at this place called the Santa Maria. It was over the water. The cool thing about it was that there were trap doors on the sides of the tables. You could open the trap doors and feed the fish below your scraps. And here I am on the beach. 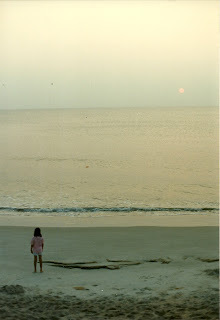 It's always been such a refuge for me...to see, smell, and hear the ocean. My Dad and I would wake up early to walk the beach before anyone else was up, picking up seashells and watching the sun rise. It's not about the sun and heat for me though. It's about the ocean itself. Even in the cold of winter I love the ocean. I saved this picture of me and my mom for last. I think it may be my favorite picture of the two of us. It looks like it should be in a magazine or something. 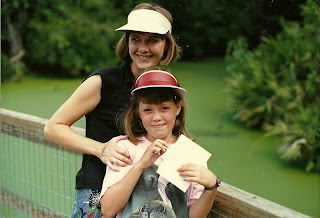 Note my cool Swatch, with the original purple wrist bands. Want to join in Memory Lane Friday to preserve your memories? It's easy! Just grab the code from the box and paste it into your blog. If there are others, be sure to come back and check out there blogs too! Next week's theme is 'The best toy you wanted but never got'. Was I ever that skinny? *sigh* Love that picture of us. Love the idea of memory lane friday! I am friends with Mary and saw it on her blog so I wanted to take part too. (I am a newbie :) I have a hard time picking just one too!